For this test, the sample is prepared in the same manner as for the two previous tests. The test furnace is left empty and heated to 2000F. The testers quickly open the door and insert the sample. For 30 minutes (20 minutes for units rated hour), the furnace is kept at 2000F. If no explosion takes place, the sample remains in the furnace until it cools sufficiently to handle. 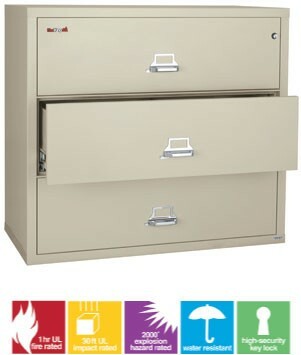 A 3 drawer lateral file cabinet provides storage for letter or size documents, binders and more. 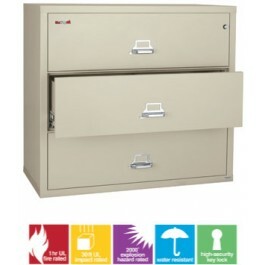 When shopping online, compare the features of a FireKing vs. SentrySafe side by side as a comparison of these name brand manufacturers.